Michael Walchhofer has the guts, the know-how and the blistering pace needed to get amongst the downhill medals in Vancouver and with no clear favourite to win the key race at the 2010 Games is a good bet to go one better then his silver at Turin four years ago. A World downhill champion and triple downhill World Cup winner he is also, for the anecdote, the son of one of the first men to ski down the north face of the Eiger. Whatever guts he inherited from his father he also has grace; after coming second at Turin he said winner Antoine Deneriaz had had a great day, crushed everyone due to lightening pace at top of slope. Less charitable viewers pointed to a clearing of fog during the Frenchman's gold medal run. Another pointer for Walchhofer, who will be 34 at Vancouver, is an outstanding 2009 downhill season, where he had one victory in Val Gardena and three runner-up finishes to take the overall title, as he had done in 2005 and 2006. As with many Austrians, he took up alpine skiing at a young age and first shot to fame as winner of the 1999 European Cup title. A good all-rounder, he broke into the powerful Austrian team who boasted 10 of the top 20 downhill skiers and has never looked back. 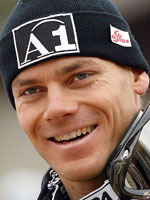 At the 2003 world championships in St. Moritz, he lined up as an outsider but caused one of the competition's sensations by winning the downhill, which remains to date his only world championship title. He did take silver in the 2005 Super G but at Are, Switzerland in 2007 he came 15th in the downhill and 12th in the 2009 event. A patient skier, Walchhofer began to accumulate podium finishes before really taking off during the 2004-05 season when he won back to back downhills at Lake Louise (Canada) and Wengen (Switzerland) respectively. He has now won a race at every location of the world cup calendar and is notable for being the only man to have claimed a double double of world cup wins. He became the first skier since Switzerland's Roland Collombin in 1973 to do the downhill double when skiing at Garmisch-Partenkirchen in February 2005. But he became the first man ever to take a double double when repeating the feat at Bormio in 2007. He is happily married with three children and on top of the considerable ski prize money has a string of sponsors including two automobile companies and one Austria's premium beer brewers. As he is known for painting the town red after a win, he will be dreaming of cracking open a few cold ones after the downhill at Whistler in February 2010.